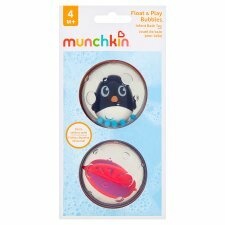 Float and Play Bubbles by Munchkin will float, spin and rattle helping to stimulate baby's early senses - sight, hearing and touch. Bubbles float and are easy for baby to grasp, each pack contains two different bubbles, suitable from 3 months of age. For your child's safety and health. WARNING! Do not leave child unattended. To prevent drowning keep children within arm's reach. Inspect before use. Discard and replace at the first sigh of weakness or damage. Always check temperature of water before placing child in bath. Please read and retain this information for further reference. Remove all packaging components before giving to child. Colour and style may vary. To Clean: Rinse with clean water. Allow to air dry before storing.